One of the very first things I figure out with any new development language / platform / IDE is how to build unit-tests with it. 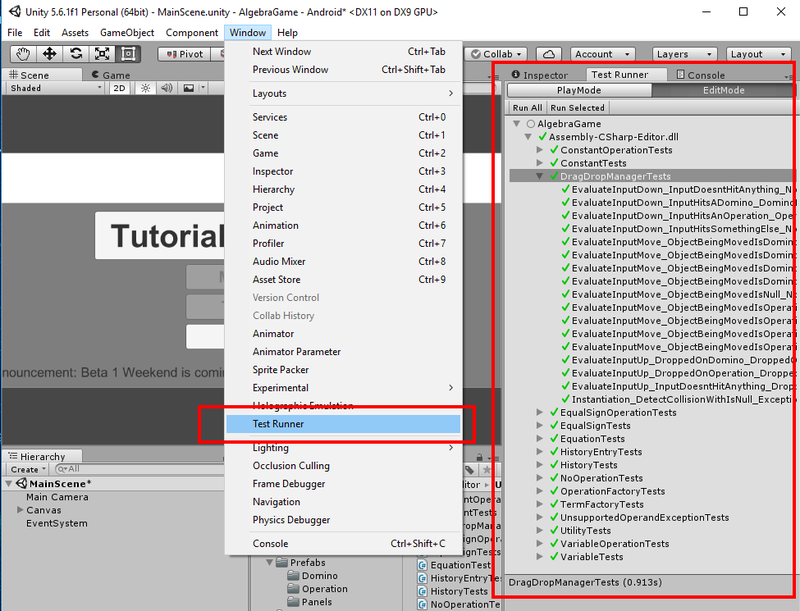 As it turns out, Unity has a built-in test-runner based on NUnit (yet another point of familiarity for me). The runner is available under the Window menu, but normally I leave it docked on the right side of the IDE. Now the next step was figure out WHERE my tests should actually live. After a little digging I found an article on the Unity Test Runner. The test runner has two modes – Play and Edit. I started with Edit, and (as the article shows), there was a button for “Created EditMode Test”. I clicked it, and it created a folder called Assets/UnitTests/Editor. I tried renaming and moving the folders in that string, and kept on eye on the test runner – would it find my test if I put it in a folder called this?. As it turns out, the “Editor” folder has special meaning for Unity. I settled on a folder structure of Assets/Editor/UnitTests (inverting what Unity created by default), so I could add other Editor scripts later if I needed. Now that I had the basic structure, it was time to get down to business, and start writing the logic for the game. 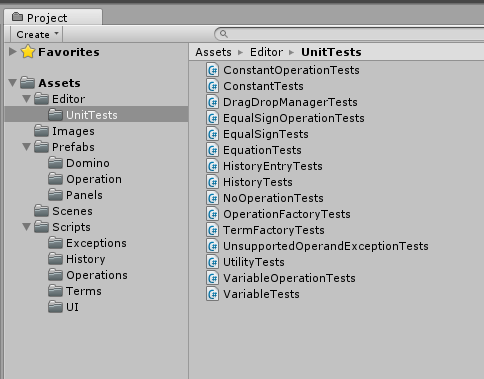 Fast-forward several weeks and 450+ unit tests later, and I have a few observations about unit testing in Unity. This stung me a couple of times – I would make some typographical error, miss this clue that my new code wasn’t actually compiling, and re-ran my unit tests expecting a change, only to find that the same test was failing because my new code wasn’t actually being used yet. To avoid this, I now do an explicit compilation in Studio, and let Studio throw up the errors and warnings I’m used to seeing. And once that disappears you know it’s done, but I’d prefer the test statuses to be cleared before each run so I can watch it work through the suite again, fresh. I’ve also noticed that the tests run much faster if you keep the focus on Unity the whole time. More than once I would kick off a series of tests, and switch to some other window while they ran, and found my tests were still running long beyond when they should have (I’ve seen suites take 2-7 times longer to complete this way). Again, a relatively easy issue to avoid – don’t switch away from Unity while the tests are running – but an odd one. Overall, I’m very happy with my choice of Unity.